Visiting the United States of America is a dream for many people. From the Empire State building in New York City to California’s Disneyland, there are so many beautiful things to see and do in the USA. However, it isn’t always the easiest to obtain a visa and can be quite stressful to plan your trip into the country. Due to the Visa Waiver Program (VFP), traveling to the United States is easier now more than ever. If you want to visit the United States you must have authorization prior to your visit. For some this means applying for a visa, however if you are a citizen of one of the 38 countries that is a part of the Visa Waiver Program (VWP), using the Electronic System for Travel Authorization (ESTA) would be easier and save time compared to getting a visa. The VWP is a US program that allows citizens of select countries to travel to the United States for up to 90 days for business or vacation, without having to obtain a visa. The United States government requires all visitors from these countries to fill out an application online, which allows the applicants to be screened for security before arriving to the US. How does one complete the ESTA application? Visitors can fill out the application directly on the Department of Homeland Security website, pay $14 to have it processed and wait for the approval. But filling out paperwork, especially when it can interfere with your travel plans, can be confusing and stressful. So why not use the help of an expert? ESTAS is a company that can streamline your application. They have processed thousands of applications and can make the application process easy and stress-free. EASY TO USE: applicants can log onto estas.net and click on “apply now” and can start filling out the application. After the form is completed, the applicant submits the payment and the results will be shown in minutes. It is recommended to submit your application at least 3 days before your departure. But you can also submit well before you even have a flight booked. HELPFUL PROFESSIONALS: ESTAS.net agents are heavily trained and familiar with the application process. They are available 24/7 through email or online chat to answer any questions you have throughout the process. TIMESAVING: using the help of the professionals speeds up the process of the application. Applications are typically approved within 15 minutes of finishing the application. Applications can even be expedited if you are in a huge hurry. COMMUNICATION: Once you have started your application process with them, they are there to help you until your permit expires. They will communicate with applicants if there is an error on the application. The option to chat online is also available in the applicant’s native language. ACCURATE: Applications through ESTAS.net have an approval rate of 95 percent or higher. MONEY BACK GUARANTEE: Payment for the application is $74 and you can pay by credit card or debit card. If for any reason, your application is denied, they will refund all of your money back. You can learn more on the website. If you are looking for more information, be sure to checkout the ESTA Learning Center, which has basic information, commonly asked questions and more! 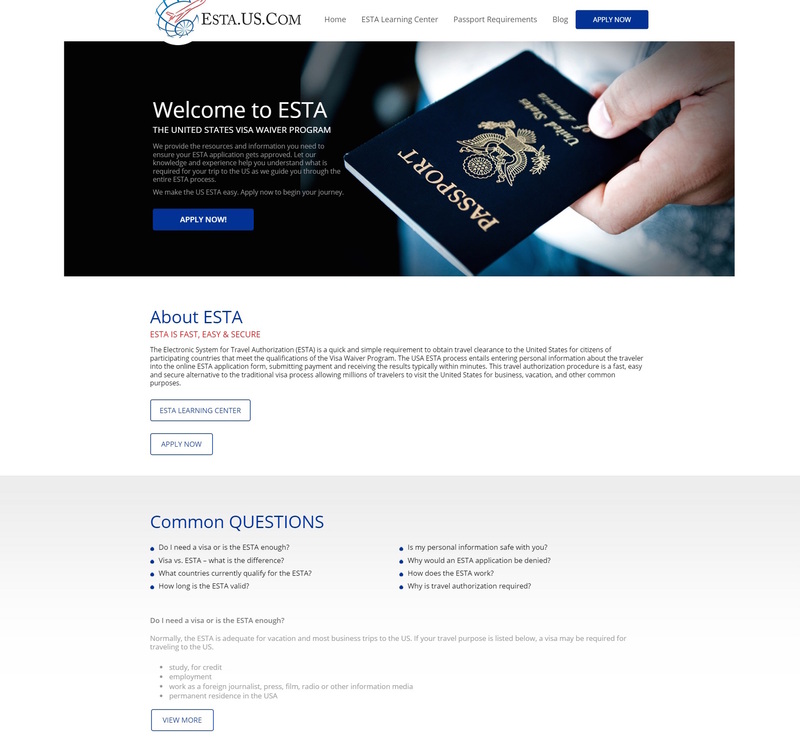 If you are planning to visit the United States for less than 90 days and you are from one of the Visa Waiver Program countries, I highly suggest using ESTAS.net. It is incredibly safe, so your information on your application is protected. The agents are professional and helpful, making it easy for citizens in the Visa Waiver Program countries to apply for their entry into the United States of America quickly and efficiently. They will help make your dream of visiting the United States a reality!